Health care and public health are finding common—but conflicted—ground in population health. Current discussions in the two fields are collecting a large and growing set of tools, but with little clarity about which are appropriate for exactly what kind of work. Furthermore, neither field provides a clear explanation about how to manage this work within the field, including budgets, job descriptions, and evaluation methods, etc. that distinguish between good and better, efficient, effective or not. The following article offers four linked domains of thought and practice that together constitute a bridge from where we are to where we want to be—healthier people and institutions—by using the idea of the Leading Causes of Life as the supporting paradigm. The field of population health in the United States reflects four key bodies of thought, which themselves rest on a sprawling terrain with thousands of agencies, “guilds,” researchers, and practitioners. Compared to peer nations, the U.S. population health enterprise is entangled in a greater cultural and political affinity for private and for-profit actors, all of whom have different agendas and are driven by individual and often perverse incentives. Without fully exploring the global field, this paper is intended to outline steps to help actors in the U.S. population health field manage health assets and resources optimally. In this sense, good management allows health and social science to be translated to proactive mercy (The concept of “proactive mercy,” denoting a blend of altruism and primary prevention, is used by Gary Gunderson in contrast to “reactive charity.” and over time, justice, that is, sustained equitable health and well-being for all.) Good management is financially smart, as it focuses on doing the right thing in a timely manner and at the lowest cost. A description of the financial accounting approach that might be appropriate to allow good management using this different model of population health. The broad field of population health is a point of convergence for four major streams of thought and practice. The 1988 Institute of Medicine (IOM) report The Future of Public Health (IOM, 1988) confronted the disarray of the public health field (including governmental public health agencies) frankly, and set underway a quarter century of laborious reforms in its structure, training, and budget priorities. Some of these reforms continue, most recently in the form of the effort to accredit local and state public health departments. This movement within public health accelerated the conceptualization of public health as a field of conscious transformation of interlinked community systems. This conceptualization of a movement in public health implies a body of competencies suited to transforming, not just maintaining, those systems (Wright, 2000), which is reflected in the emergence of nearly two dozen state level leadership institutes aligned with those bold future-oriented goals. The 1988 report was revisited and updated in the 2003 report The Future of the Public’s Health in the 21st Century (IOM, 2003). This underscored a key insight, which was that public health as a field is still new and under construction. when performed collectively and reliably, have been proven to improve patient outcomes” (IHI, 2015).) of care offering greater value for payers (and presumably patients). His book with Elizabeth Teisberg on Redefining Healthcare (Porter and Teisberg, 2006) makes tactical operational recommendations addressed to those managing health care businesses. Porter and Teisberg insist that systems act like systems, not just a collection of facilities. Porter and Teisberg offer great hope for the role of rationality, discipline and, of course, financial incentive. Within a system or within a referral region, volume should aggregate to the sites capable of the highest quality—those specialized enough to have high volume—and thus the highest economic efficiencies. In practice this means, for instance, closing obstetrics or cardiac surgery units at small hospitals, driving the specialized care to a hub or even to a competitor. In actual institutions those decisions are excruciatingly painful. Crossing the Quality Chasm contained a whole chapter on health care organizations as complex adaptive systems with quality as an emergent “system property” (IOM, 2001). Porter’s work has been influential in other developed nations, notably Germany (see for example Porter and Guth, 2012). It is worth noting the limitations of the work in the context of the present discussion. In their foundational work cited in the United States, Porter and Teisberg never mention anything or anyone outside the hospital system walls. (Porter’s new work on the Social Progress Index goes in a quite different direction well in range of the concepts discussed here. It will be interesting to see if the health care executives still tuning to his earlier work will follow this work, too. See http://www.socialprogressimperative.org/data/spi.) Bundles are still wrapped around episodes of care with little attention to the long cycles of care that chronic conditions demand. Because this work is aimed at managing organizations, it minimally considers the social and community context, and also does not acknowledge positive human complexity, especially to scale and practical works of altruism. Surprisingly, it overlooks the role of timing in highlighting the future value of optimal intervention and the future costs of sub-optimal action. Also, there is no consideration of low-income populations in this economic model of health care. In short, the Porter and Teisberg model is helpful for top-down competitive management of the health care enterprise, but not for integrating that work into the larger social whole. The three major currents described above—public health, quality health care, and health care business—are visible in the documents of the Affordable Care Act (ACA) and its closely related policies, dealing with the accountability of the non-profit component of health systems (Emanuel, 2014). The ACA legislation, perhaps more than most, is the product of negotiation and compromise, and its implementation at state and county levels, where health care actually happens, has been far from smooth. Throughout its conceptualization, negotiation, legislative, and judicial challenges, and now, implementation, the shape of payment systems has dominated the dialogue, but population health is the subject of most of the law’s hundreds of pages. Occurring largely out of view of any of the three previously described currents of thought and practice, but adding a helpful fourth dimension of the context, is a wildly creative season among non-profit and non-governmental organizations focused on advancing health, well-being and development at the community scale. This “movement of movements” reflects many contributing streams, notably community organizing built on the Saul Alinsky and PICO (a national network of faith-based community organizations) traditions, new urbanism largely driven from city planning for the “built environment,” ecological and food organizations, and a wide array of new roles and programs within and between faith organizations. This fourth component is the one with direct overlap into the fields of health care and public health, especially the thousands of “faith community nurses,” many adjacent caregiving roles, and multiple adaptations of the Memphis Model’s hundreds of connected health congregations (AHRQ, 2012). As both health care and public health move toward greater recognition of complex human communities, they find themselves in a tumult of creative work relevant to their goals, but quite out of their direct control. Various conceptual models have been suggested to bring order and more predictable outcomes to this emergence (which looks like clutter to those accustomed to control or top-down management). The most popular is “collective impact” with its prescription of a “backbone” organization with common metrics to achieve measurable goals (Kania and Kramer, 2011). More recently, a White House conference of Stakeholder Health and community partners resonated with the idea of a “trellis,” constructed so that many types and sizes of community assets could find sun and nourishment without demanding the premature simplification, prioritization, and privileging that top-down/center-periphery management models put in motion and then sustain. Centralized, hierarchical systems are rare in nature, where ecosystems tend to be smart at the edges and innovative at the bottom. Nearly every health care system in the United States is involved in or actively considering some pilot exercise in “population health management.” This now ubiquitous phrase covers a wide array of schemes to manage the delivery of health services to a defined population of people sharing some characteristics of disease, condition, age, or payer. Those conditions may or may not have clinical relevance. And other well-documented factors—like place or social factors—are rarely included. The Centers for Medicare & Medicaid Services (CMS) have created several types of pilots with some degree of creative room. But the first step for most health systems is participation in one of the Medicare Shared Savings Programs. These pilots have a tightly prescribed set of indicators, like training-wheels, that a health care group can attempt to deliver to a select number of Medicare members. If done correctly, those interventions promise a savings against normal cost momentum, which produces a gain to be shared between the health care systems and CMS. The current scale of inefficiency and, thus, possible savings, is almost beyond the imagination of laypeople, but not beyond calculation by health economists. For example, at Wake Forest Baptist Medical Center (WFBMC), a typical cohort of 15-20,000 members assigned by CMS could produce a $10-$20 million shared gain if the health care group achieved a modest savings of 5 percent below projected cost. And like the old-fashioned paint-by-the-numbers pictures, the result might not be artful, but you can at least recognize the subject as population health management. It may create confidence and appetite for less restrictive, more adaptive models built on local challenges and assets. Or it may do the opposite and encourage hospitals to think of their efforts as artful when they are just fulfilling others’ prescriptions, not even aware of adaptive opportunities. Private payers, eager to demonstrate the value of their role in the era of population health, are entering into many less prescriptive, more creative and thus, less certain, gain-sharing schemes with providers. Of course, the private payers are primarily interested in very defined populations with their members usually organized by medical condition, not place. Medicaid is an entirely different arena because the patients are poor and not just old. In many states the Medicaid payment per member is dramatically lower than for Medicare, meaning that the providers who work with this cohort are themselves financially constrained. These programs are already stigmatized and inevitably tangled with state and local politics, in interactions with decision makers who may be unfamiliar with health care or public health. Take for example North Carolina’s NC Community Care Networks, which despite providing great quality of care, are often at risk for funding cuts. There is almost no active attempt to manage populations of people who cannot pay at all, often broadly defined as “charity” or uncompensated care. (The term “charity care” is used in this paper to refer to uncompensated care of those with no ability to pay.) In states with Medicaid expansion the absolute number of such individuals has decreased, but in no place has it come close to universal coverage. Even in states where most are enrolled, there is a very large quiet churn, as people on Medicaid roll on and off, usually experiencing a period of non-coverage, which creates a large exposure for hospitals. The charity care population is utterly unconstrained by the mixed motives of payers and so offers a pure creative space for health care and public health to collaborate using their own money. It is rare for the most poor to be seen as proactive collaborators in their own health and, thus, rare to see them engaged creatively with more mature health system strategies for health improvement or treated as partners in their own health. Population health needs a better integrating idea. Crossing the Quality Chasm (IOM, 2001) understood organizations as complex adaptive systems, but then ironically prescribed a long and complicated to-do list. Even those institutions and leaders who agreed with the recommendations missed the call to complexity, that is, the importance of focusing on dynamic, ever-evolving networks and not just linear directives and thus, failed to fulfill the adaptive promise. Human populations live in even less contained, more complex, systems called communities. The health that seems so obviously possible is the fruit of a systems effect, expressed and made visible by the vitality of a living system. The first step toward advanced population health is to seek language that is not reduced to a complicated to-do list managed by committees at a privileged table. If we want a vital, thriving population, it is better to use language and logic built for life. The decades of movement of thought and action only hinted at here deserve a moment of respect. Because of the great gains in quality of health care, hundreds of thousands of people are alive today. And a similarly profound turn of direction is well underway, reflecting Porter’s prescriptions. These twin movements are continuing to mature, letting us see, still some distance away, the time when quality is normal and disease-care systems are rationally aligned. Both fields fell farther short of that basic standard than laypeople had any way of knowing. And we remain well short of what is possible. Getting to the point where all the component tools and practices for improving health are dependably competent, efficient, and fairly available to those who need them is the promise of World One, or the first stage in the evolution of systems to improve population health. We should never treat lightly the successes of World One process improvements. However, most professionals in health sector organizations are eager to get to World Two, an entire quantum more complicated. World Two is marked by the thoughtful gains and synergies achieved by integrating and aligning the many tools, procedures and techniques for detection, prevention, treatment and management of disease conditions. This is within the range of most schemes of population health management, which all have in common the focus on disease. Defining a population of people by their disease condition hides the things that are most interesting and vital about any group of humans. They are not just somewhere along the path of dying, they are alive. And they are not just related by way of their diseases, but many other more complex ways that are part of why they are not already dead. It is not appropriate or respectful to regard people only in terms of their disease status. And it is not helpful—even for those whose institutions are most relevant to their disease status—to see them only that way. Donald Berwick, reflecting on the first 25 years of process improvement labor, noted that his grandson was teaching him about health, a subject that was shockingly new to him. He outlined in his 2014 Annual Remarks to IHI how his personal vitality and life force was intrinsically enhanced and tied to that of his grandson Caleb. (See http://www.ihi.org/resources/Pages/AudioandVideo/IHINationalForum2014KeynoteVideos.aspx.) Surely we can do more to move in that kind of direction, toward World Three. Identifying and tracking a select but operationally meaningful set of factors that “cause” life opens up a whole different way of organizing the strengths, structures and assets of the health sector in a way that resonates with people and their social networks. Rather than lining up all of our disease-oriented tools and interventions so they are triggered into action by finely tuned information systems looking for illness, we might find a way to build the resilience and adaptive capacity of individuals and their living social networks (something that Berwick’s grandson might recommend). The essence of World Three is that the many complicated parts of our institutions, guilds, networks, and relationships, with the huge array of now-relevant community partners and social assets, find alignment by their contribution to the life of people and the life of the social whole. The primary organizing logic rests on the causes of life rather than the causes of death. Charles Darwin was primarily curious about life and its superabundant creative proliferation, as well as the intimate wonders of his daughter and soul-bending pain of her death. In a landmark book he wrote of “the great tree of life … with its ever branching and beautiful ramifications” (Darwin, 1859). He was not curious about what was wrong, but how that beauty emerged. Jonas Salk, famed for his polio vaccine, focused much of his later career exploring the ideas of how life—like a virus—found its way, on “an epidemic of health.” (A living stream of this thought is found at http://epidemicofhealth.com/ (accessed October 9, 2015).) Aaron Antonovsky provided another early clue with his tough and smart research into coherence and the “mystery of health” (Antonovsky, 1987). To do more than just arrange our disease-oriented tools and techniques, we must have a stronger intellectual paradigm than death. We could try to organize ourselves around the leading causes of life. Although far from finished, the idea, not a blank page, turns out to be one with which we can work. Larry Pray, who co-authored Leading Cause of Life (Gunderson and Pray, 2009) noted in his writing that life has a language. And as neuroscientist Paul Laurienti, a Fellow of the Leading Causes of Life Initiative, has also pointed out, it is a fitting language for the complex fluid social life of human populations. If one thinks that humans are simple and their populations complicated but merely needing treatment, one does not need a complex language. But we are complex, and so we do need that language. (For more information, visit the website for the Leading Causes of Life Fellows at www.leadingcausesoflife.org) It may be helpful then to sketch the structure of the thought, so as to indicate how different it is as an organizing logic than the disease and death categories that currently dominate our management imaginations. The Leading Causes of Life posits five core causes which are dynamic and emergent, because they express the most fundamental human capacity, the energy for creative freedom. That energy, understood as “spirit” in Africa, is the basis for human creative choice that makes us moral and thus human, a Kantian notion (McGaughey, 2006). That energy, expressed at social scale of community and populations, is what allows us to think of healthy human populations and not just managing the care of a group of mammals. Humans are a special kind of mammal who respond to nurture, inspiration and trust; more than can be managed. The idea that any population’s health could actually be “managed” is a bold claim, given the nearly infinite array of factors in play over each person’s lifespan, multiplied exponentially by social dynamics. However, surely we must give ourselves to the possibility of influencing the dynamic complexity toward health or risk abandoning the deepest desire of our very best human selves. That is World Three, which can be described in the language of life with five words: connection, coherence, agency, inter-generativity and hope. These are the leading causes of life. grow across and beyond lines of blood and money, especially in vulnerable populations, as seen vividly after the June 2015 shooting at Mother Emanuel Church in Charleston, when a young white man inflamed with the idea of starting a “race war” gunned down (It should be acknowledged that we never see causes per se; only the effects we experience, and to these we attribute a “cause.”) innocent black church members after their Wednesday night Bible Study (Weisman, 2015). Social networks develop distinct patterns of social strengths relevant to the community system (Gunderson, 1997). Aaron Antonovsky understood health as a mystery. In the brutal, painful fragility of human experience, healthy human life was a surprise explained in part by the fact that humans are capable of finding coherence across the span of time and circumstances that allow us to go on in our lives and help each other along the way. This coherence at the root of Antonovsky’s concept of salutogenesis is evident (once you know to look) in a wide array of health practices and initiatives now finding visibility in the fields of recovery, re-entry, resilience, and re-many sorts of things. (Samueli Institute website, https://www.samueliinstitute.org/.) Humans make sense of things, and this enables us to make our way in life. This gave Salk hope (Salk, 1973) that we might be wise. As adults, we often make sense of our lives by finding meaning in contributing to the life of the whole, beyond what would make sense in a purely individual sense of rational self-interest. Humans practice this altruism often, and have for decades. Kant defined the basic human essence as creative freedom, a unique (in degree at least) capacity to change nature and ourselves, which includes our social institutions and relations (McGaughey, 2006). Humans choose in ways complicated and simple, sustained and spasmodic, intentional and apparently capricious. We choose to do this not that, now or next week or never, here or somewhere over the mountain, with this not that person or group, for reasons that may or may not even be conscious. Sometimes without any authority or credentials except for urgent necessity, humans choose because we may only have agency and not much else to leverage. Radically excluded groups such as AIDS orphans still find the power to choose even in deeply constrained circumstances because they must and can do the best that they, as humans, may. All of this is true of dyads, and the small groups called families, and the larger groups called neighborhoods, or the more formal entities called towns or counties. Humans have creative agency. Life comes only from life, perhaps from a comet, more commonly from a mother, often made possible by another nearby adult who may or may not share blood or DNA. Our experience of what is received from past generations and what we seek to pass on to the next plays a crucial role in shaping how we live in the present. Life is not just generative in nature but also intergenerative, helping us become conscious even at an early age that we are capable of being active in the co-generative processes of social resilience and vitality. This is the essential spring in a democracy and all its public institutions, including public health. And it is the spring under the generous and tough institutions of faith capable of tenacious hope and, even more remarkably, forgiveness (evident in the very mature and finely wrought nature of faith on display in Charleston after the mass shooting in June 2015). The best documented phenomenon in any health or social science literature is the way that hope becomes biology by affecting behavior, choices, courage and even the biochemical level (external pharmaceuticals excluded here). Hope, forward-looking, is uniquely powerful in the human mammal in much the same way that memory is powerful in other creatures. Of course, we humans fear, too. Like pain, fear is protective and adaptive, but hope is more surprising and extremely relevant for making things possible that have never happened before, such as healthy populations living into the potential that 2016 science illuminates. Vivid hope based on real connections, illuminated by shared meaning and understanding of the relevance of social agency… has not happened, yet. But it could, and we are free to hope for hope, maybe free enough to choose it, when hope becomes anticipatory action in the cause of life. The five causes of life described above account for the dynamic and emergent phenomenon we call human life. Each of the causes is multi-relevant and non-linear, functioning in relationship to the whole social network that is alive, not just in one person or a discrete set of us. One need not be a social scientist to grasp and work with these core causes; one only needs to know a single human child to realize that we are complex—but not too complex to act with purpose and create systems at population scale that tend toward vitality. The Leading Causes of Life give us a language to describe accurately and vividly what we experience as human persons who have wept and laughed, known bitter disappointment and delight in the struggles of health, at intimate and large scale. Those are social descriptors, not just individual, which makes it possible to use the same language for populations. What does life have to do with human populations? First, populations are alive, as are the individuals in them. The group itself—if conscious of itself as a social whole—is alive whether it is a group of refugees on the violent border of Syria or the neighborhood of mostly older people behind the hospital. It is alive and can be described, usefully understood and nurtured, in the language of life. This qualification about group consciousness is not a small one. A group that is not selfconscious of being a group is less alive, even if its members as individuals are living. A population defined by its insurance status is not very alive; it is not connected, coherent or capable of agency of its own even though it may be a useful grouping in someone else’s mind. Such a grouping is like any collection of mammals herded and managed to the limits of its master’s intelligence and array of tools, but not capable of its own generativity or creative freedom. It is not alive. The most it can hope for is defined by the limitations of World Two ideas of health system excellence—access in a timely manner to services that might diagnose, prevent and maybe manage whatever diseases to which its members are prone. It is easiest to imagine the life of a population that lives in a place where one can walk and experience: a neighborhood. In our data-drenched era, a neighborhood roughly contiguous with a census tract can be known in intimate granular detail down to the level of the household. Websites are freely available to describe everything from graduation rates, patterns of violence and every imaginable social variable. A public health department can easily layer data on disease prevalence and housing or economic data about a given area of the community. The health care system sees, through the lens of its different databases, the wicked patterns of disease, treatment, cost, payment and often, bankruptcy. It can, although it usually does not, see patterns over time at the level of blocks of streets. Realtors and merchants may layer on other knowable factors known as psychographics, seeing the nuanced nature of the purchasing preferences and messaging means. If you need to sell something or prevent or treat a disease, this level of knowing may be enough. But none of these ways of knowing quite capture the life of the place or the life of the population. A living human being is more than its mechanics and more than its disease. It is a complex, adaptive, choice-making, meaning-rich, generative, future-seeking creature. It is alive and thus far from mechanical, certainly far from manageable. Knowledge of that complexity makes one humble but also hopeful. A human being cannot be controlled rigidly and will not necessarily follow instructions or prescriptions; is not likely to be compliant. But it is alive and capable of more life. Harnessing, nurturing, encouraging and creating space for this life, and then aligning it with all that we have gained from Worlds One and Two, is the task of World Three health systems. The Leading Causes of Life are a good start in the right direction, even if another more robust paradigm may in time emerge as we move toward World Three in health system evolution or maturation. A good paradigm will tune our curiosity toward the life of the human system that lies beyond the instrumental “doing-to” and “speaking at” models of population health management that are likely to prove disappointing in the coming years. World Two will be better and less costly than World One, but still fall obviously far short of what one might expect, notwithstanding the astonishments of technology, imaging, and connectivity now available to health care and public health. The Causes of Life are useful for thinking of one life (such as one’s own) or of the life of a family or small social group, such as a congregation or neighborhood. Below are questions that describe how thinking about the leading causes of life may drive World Three dynamics (or the most mature stage of health system development). In other words, how do connection, coherence, agency, inter-generativity, and hope help move the system in the direction of greater maturity? Connection How is the population already connected? Is there a logical perimeter to the population that defines and gives it consciousness? How are those connections experienced? What are qualities of trust, fear, compassion or respect in those connections that mediate the relationship with an external institution? Is the hospital or public health organization perceived as connected or “other?” Are there other entities that might mediate that relationship? Does the health entity have members (employees, staff, relatives, or faculty) that are part of that population as it understands itself (i.e., does anyone of “us” live “there”)? Coherence How does the population understand itself and its situation, its circumstances and relationship to others? A history of active exclusion or social conflict may be invisible or underestimated by the central health-oriented organization in a community, but a vital defining reality to the population (part of why charity care populations may be entirely different management issues even with similar medical issues). Are there nodes of meaning and generativity within the population that are trusted for truth-telling? Often churches or congregations (Gunderson, 1997) play this role in a distressed community (but not all churches; some are part of the incoherence system). Are there shared meanings that create at least a limited “us” in the context of otherness? Are there signals, messages, messengers, media, venues, and processes that can engage and help external entities listen so as to understand? Yes, of course. But this is different from creating focus groups to inform management of the other. Is there any sign that the stronger or dominant group is willing to be changed by the change process? Why would the weaker group participate, if not? What preparatory work might the stronger group undertake so as to be ready to be changed by a meaningful, collaborative process? Inter-Generativity How could engagement strategies draw on the positive energy of grandmothers reaching toward mothers, fathers and their younger children? What relationships can be imagined when differences in age mark possible pathways, not barriers? How could the young, especially estranged young males, be drawn into powerful positive roles by seeing them as generators of social connection? How could other businesses, non-profits, and public institutions such as schools find strategic relationships focused on their mutually enhancing generative roles, rather than mere providers of services defined by needs? Can long term planning documents such as those emerging out of formally mandated Community Health Needs Assessment (CHNA) processes leverage those generative nodes to contribute to vitality of community systems? assessment. In some communities, a slight touch of World Two thinking sneaks in, signaled by implementation plans focusing on conditions that are more obviously multi-factorial, less amenable to one-shot investments. Obesity, or better, food, is such an integrative priority. It generates more of a World Two list of multiple kinds of things that might be woven together like a bundle that might find synergy and thus more likely impact. The list is still generated out of what is wrong and thus limited by imagining something missing. What do we want in place of pathology? What if the CHNA approach was re-organized around a search for the positive vital nodes in places where life has been overlooked and under-nurtured? Generative nodes are multi-relevant, lending their creative energy to complex life processes. As we write this, we are reminded of New Light Baptist Church led by Reverend Sam Hickerson where the congregation—already quite alive—is undergoing preparation to begin a process of knocking on doors of surrounding streets to let people know they are connected. The church will soon open a small health ministry staffed by volunteer church members, doctors and physician assistants to help people manage their chronic conditions and get advice on their pharmaceutical needs and other social supports. The node is already there; we just recognized it as generative and came into relationship, so that it could be strengthened to do what it already wanted to do—be an agent of life for its surrounding community. Hope and Agency How could the Leading Causes of Life logic improve the chances that long term planning processes release new energy into the community systems? Can the Leading Causes of Life spark more engaging and vital visions that can resonate more powerfully with all the components of the community systems? As noted above, can CHNA strategic planning documents and efforts be tuned toward instilling hope instead of lingering over deficits? People in most neighborhoods, organizations, and circumstances can quickly tell you what they need. The need is usually defined by what they do not have, or have been taught to think is necessary. Sometimes they can tell you what they hope for, too, meaning more than a mere wish, rather a journey into fullness of health and well-being. But that is a different thing, which one does not just blurt out to an anonymous surveyor. An individual can identify specific needs, but hopes can only be identified in relationship to and with other humans. In the context of the Leading Causes of Life, hope is grounded in vital connections that are meaningful at depth and lend energy to one’s agency or at least resilience. Hope makes itself more likely to be fulfilled even when its generative power is expressed in making someone else’s hope come alive. Older adults typically hope for those that they know live will beyond them and thus, find energy beyond mere medical optimism for themselves. Living in a community of hope also gives energy to one’s own agency even if—especially if—expressed in strengthening others’ vitality. The causes are not a list, but a dynamic ensemble. It is the ensemble of the leading causes that is vital, not just one for this population problem and another for that one. The core causes describe a complex adaptive human system and allow us to see how we might add to its vitality, not just fix something broken or defective within it. They help us imagine and thus make more likely World Three. The Leading Causes of Life help us see what might be possible beyond our continued efforts to wring quality out of our health care technologies and wring efficiencies out of our World Two bundles. World Three allows us to align our assets and strengths around the causes of vitality, thriving, in short, life. If a community is a complex adaptive living system, what are the tasks and roles that contribute to life at population scale? What do we do day by day; week by week? We should keep in mind what happened to the appreciation for complexity at the heart of the IOM Crossing the Quality Chasm report: it failed to produce the systems’ effect despite setting off a plethora of committees and processes. Things are much improved, but hardly what was imagined to be possible. Complex human systems are more like gardens than machines; the roles needed are more like gardeners than mechanics. Gardeners understand that they themselves are part of the living system and that everything matters. One of us (Gary) once performed a wedding for two members of Carter Center ground keeping team in the rose garden of The Center, which included ceremonially planting a rose bush. Ritual became actual as the couple dropped to their knees despite the gown and tux. They gently spread the roots, reached for the shovel to widen the hole and gently filtered the soil around the roots honoring the life of the plant and of all life including their new marriage. In the best of circumstance, those who work with the health of patients and populations also give of themselves naturally and completely. The roles that matter in the health of complex human systems look like the tasks of World Two workers, but in fact they need to be freed and accountable for a more complex role. A healthy complex human system requires work that turns it inside-out, upside-down, and out of control. Inside-out The early phases of population health improvement work have been remarkably vague about the role of the population in its own health, as if a population would become healthier by means of what the professionals at its center prescribe. A population is a living social network marked by roles and nodes, each of which can be understood as having and contributing to the quality of life in dynamic fractal processes. Each and every one of those roles can be mapped by how it nurtures and enhances conscious connection, adds to coherence and resilient social consciousness; by how it manifests and encourages agency; by how it reflects and makes visible generativity; and by how it produces and signals hope for the members and the whole. Every role played by every member in every nodal institution can be seen in this way and thus enhanced, on purpose, systematically. A church secretary can be seen as crucial node of connection who, by the tone and language with which he or she answers the phone, can send a true signal of inclusive compassion and useful agency in a crisis situation. A secretary can alert members of the smallest congregation to the relevance of their agency in the life of another; perhaps as basic as lending a ride, or delivering a bag of food, or just listening to quell loneliness. The assistant manager of the local hardware store has similar relevance and could be trained to enhance his or her generative role in the lives of customers’ families, as well as other employees. Most of the most relevant roles in a living system are not paid to enhance the qualities we call “health.” The institutions called health care or public health are better understood as parts of complex human systems that are alive. Health is the fruit—the systems’ effect—of a healthy life system. The system thrives when the conditions are nurtured and prepared (Public Health 101) and from time to time treated or pruned (health care). But everything works better when the agency at the edges of privilege is animated rather than made passive. A classic inside-out role is the one that emerged in Memphis is the navigator of the Congregational Health Network (CHN). This full-time paid-by-the-hospital role was situated on the boundary between health care and the mediating structures of congregations. The job looked like a complicated blend of patient-care manager, community organizer, health educator, and of course, navigator. The role is more complex, better understood by its effect on nurturing the connection, coherence, agency, inter-generativity, and hope of the social structures involved: families, networks of friends, congregations (and its sub-structures such as women’s prayer groups), and larger networks such as ministerial associations, and semi-professional groups such as the owners of beauty parlors—all self-conscious of their role as agents of the life of the whole system. The multiple stories of compassionate care for the vulnerable are true signals that tune the whole system to what to hope for and how to see each individual and node as relevant to that hope. In Memphis it was quite important that those in a position to nurture the system (not quite right to say “lead,” and certainly not right to say “administer,” or “manage”) understood that what did the work was the whole complex thing—all 599 covenant congregations, all 4,500 people who had received some training, all the clergy, all the 602 volunteer liaisons, all dozen navigators and significant parts of the 13,000 employees of the hospital, public health structure and multiple community partners such as the Church Health Center. The paid roles were sustainably successful and visibly trusted, largely only to the extent that they realized they were agents of vital social complexity, not mechanics of a delivery system. There are many people working in roles that could be translated into roles more like the CHN navigators if their employers turned their own minds inside-out and retooled the expectations, training and accountability to be relevant to the complex population effect desired. The first minds to be changed must be the ones currently at the center. Once they change, they can see many, many roles in their own organization and many partners who could embody the functions and work of a health population system. Every insurance plan has armies of care managers, every public health department has dozens of community health workers, and every hospital now has dozens of social workers and care coordinators. None of them has ever heard of “life” as “causal” and would be surprised to find themselves expected—rewarded—for nurturing it. Frequently, the best of the people in these roles do intuitively, sometimes even fully consciously, understand life and have found ways to get away with doing the right thing despite the instrumental nature of their job descriptions. What if they were free to perform their natural role? The language of life is a natural language for describing a natural population system, not just a set of new clinical practices. Nothing is more efficient than a well-adapted natural system, whether it is a tidal marsh or a forest of healthy people. A vital human population is highly efficient because it aligns and animates the full assets of reimbursed and non-reimbursed relationships that are tuned to respond in real time to the opportunities for healing, nurture, and care. The parts of that system that are reimbursed find themselves operating in an environment far more likely to allow efficient delivery of treatment, more likely to “work” and result in far less inappropriate demands on expensive care. Health care moves from the center; life goes to the center where it belongs. Yet this is not quite radical enough for life. Upside-down World Three is marked by different power relationship created, nurtured, and sustained by roles designed to signal the new level of shared agency. The traditional fields of health care and public health are marked by privileged knowledge and power, access to which is literally understood as a matter of life and death. This is obviously true of World One, but surprisingly, even more so in World Two, in which the logic driving integration is almost entirely in service of the disease treatment industry. When it speaks of population health management, there is no confusion about who is managing whom. A healthy living population system is most alive at the edges, where all the adaptation is mediated. But much intelligence also lives on the bottom of the system. Thus, it is not enough to turn the power from the center to the periphery; it is necessary to animate the power from the bottom to the top, by defining roles that embody those new relationships. The upside-down part of thriving complex human systems may be the most difficult part for traditional health care guilds to comprehend, as nearly all roles follow a hierarchy with competencies defined and valued from above. This is obviously appropriate when the agent and agency is prescriptive, based on scientifically vetted knowledge. Since the Flexner Report in 1910, American health care has vigorously scoured out the hallways, leaving space only for credentialed medical professionals, of whom physicians have been the apex, and thus, also the most scrutinized. There will always be a place for roles protected and credentialed in this way. But living population systems need roles built to mediate other types of knowing and other types of trustworthiness. 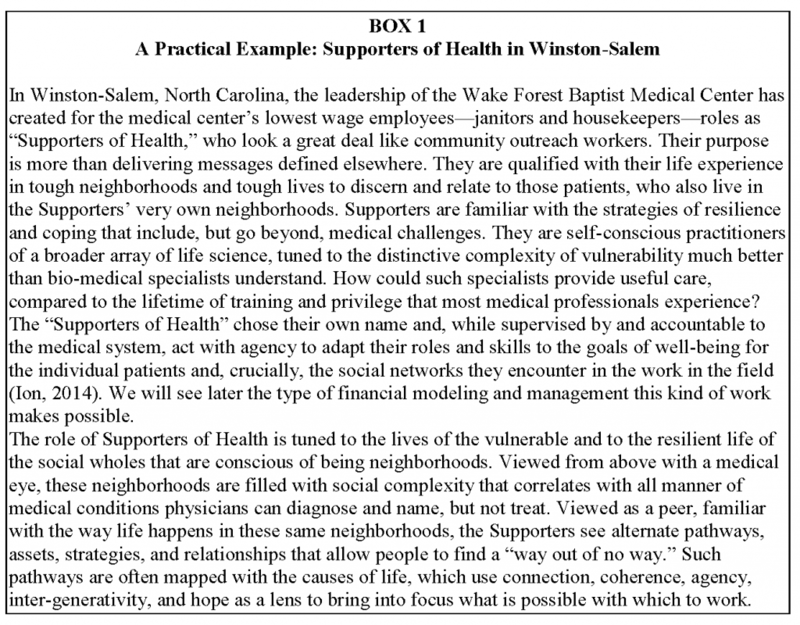 Box 1 provides a practical example for how such a role has been created and implemented in Winston-Salem. Many roles in health care settings, sometimes viewed as marginal or non-essential, represent resting assets with agency and knowledge that can be part of the healing and thriving of the community system. Former felons turn into insurance enrollment specialists in Ohio. Those struggling with addictions become peer counselors. Gang members become anti-violence mentors. The organizing goal of World Three is the thriving of the whole complex human system. For that, one needs to animate the energy and intelligence available throughout, especially in those areas that are most overlooked. population systems have strong and dependable components including high quality health care in all six STEEEP dimensions and public systems. Walker and Salt note that resilience depends on “linking elements that allow them to be reconfigured and adapt in response to change or damage” The roles above are obviously strong on resilience, building human relations beyond mechanical “access to services” by means of all five of the leading causes of life. Human systems are not defined only by individuals, institutions and reimbursements. Complex human systems live by means of roles that allow individual humans to assume identities and achieve competencies vital to the large system. Institutions are like the trellis on which roles grow and find support. The Leading Causes of Life illuminate the pathway but do not walk it for us. Just as we are hard at work bridging the quality chasm so vividly described 14 years ago (IOM, 2001), clarity of language will only allow us to begin the long labor. The five causes help us see what is possible by making clear the crucial patterns of generative life already present in any group of humans, in any human at all. The leading causes focus on Darwin’s question: where did all this life come from? What accounts for the inexplicable diversity, resilience and adaptive variety? These are questions to ask of any human population as a first step toward seeing how it might be more vital, less sick; thriving and needing less care; efficient and less costly. resources, available to invest in processes and institutions relevant to the health of the population? A healthy human population thrives on many types of assets, not just cash to pay for health services delivered in professional venues. The African/International Religious Health Assets Programme (ARHAP, now IRHAP) based at the University of Cape Town, has worked to understand the array of tangible and intangible assets that can be aligned for sustained health over time in communities that appear to be lacking in almost everything (ARHAP, 2006). Some of the most relevant health assets are those that do not realize they are relevant to health at all, including institutions of education and leadership development for those in civil society. The clinical and preventive assets also have dimensions of trust and credibility that make highly visible assets (like community-based safety net clinic services and annual screenings) meaningless (when trust and credibility is low) and raise up the relevance of those that may seem of less obvious value (where trust and credibility is high). Much of this work emerged in southern Africa during the HIV/AIDS pandemic, so questions of overwhelmed resources and gross inequity sharpened the thought. The work was key in the development of the Memphis Model with its focus on assessing community health assets in the toughest parts of town. Many of the most important assets over time are those qualities we would now name as leading causes of life. Can these assets and the investment made in strengthening, aligning and animating them can be managed with more relevant discipline for higher level of outcomes than the tools of health care management allow today? We’ve suggested that this should not be a high bar to exceed, given the steady failure of health care to do anything but become more costly. Can we systematically manage our investment in complex human systems? It is difficult to reimagine all of a trillion dollar array of activity at once. Disentangling the wickedly perverse tangle of self-serving relationships that define American health care is too much for any mortal. It might be helpful to understand the only part of the health care and public health systems not tangled in negotiated deals, the part serving people who do not pay at all— which we shall refer to as charity care. These are the only kind of patients whose relationship is not mediated (dominated) by a payer’s fiduciary conflict. Health care systems are spending their own money providing care for those who do not pay. Thus, these systems can only blame themselves if that care relationship is only simplistically managed. Yet, to my knowledge, not a single health care system in the United States actively manages even the cost of charity care, in the sense that anyone is in charge of making that number go down or produce measurable value. Charity care is not held accountable to even the first aim of improvement described in Crossing the Quality Chasm—lower cost—much less the other five (IOM, 2001). Health care organizations can blame government and insurance companies and medical guilds for our problems with other patients, but not these; funds spent on charity care are entirely a health care organization’s money. Charity care removes money from the discussion and shifts it into World Two; the only part of our entire health care field that is situated there. While we are at it, why not understand charity care patients as our pioneers into World Three? Can we see the model of financial management through the relationship to charity care, illuminated by the Leading Causes of Life? People who cannot pay at all present the same clinical challenges than other patients in any particular treatment event. But their economic vulnerability and the lack of fixed financial assets seriously affect their participation in more complex bundles of care. Charity care patients fit reasonably well into World One, but not at all into World Two … currently. This is the big missed management opportunity—it is a simpler economic event: binary without involving a third party payer. This means the focus of attention needs to be on those two parties—one presenting sick and one trying to help. The provider is free to be as smart as they want to be with no distractions. Generally, charity care status is an economic marker correlated with predictable social markers, themselves correlated with geographic markers. Poor people tend to live together. In a very concrete manner, while it is not possible to predict exactly which poor person will need health care in any given year, it very easy to predict the streets on which they live. Charity care turns our attention to the populations that live in neighborhoods that tend to be vulnerable. The charity care neighborhoods are usually “at risk of risks” showing up in the same dismal maps about any dismal community problem. Hospitals find themselves in relationship to sick neighborhoods, not just a stream of sick patients. presenting roughly the same volume of need year over year, the vast portion of which we offer at the most expensive possible site, the emergency room. This highlights the ironic reality; the reason the cost is high is not too much medicine, but too little offered at exactly the wrong time and place. would shift financial liability from the hospital, technically making these highest cost patients no longer charity care. For purposes of this article and from the perspective of population health, it would just mean that whoever is paying that insurance would adopt a healthy population system to manage those high costs rather than just shifting those costs to the government through reinsurance. Somebody has to do something real.) Even a cursory analysis of the drivers of repetitive demand on medical services at the emergency room shows the primary issues are not purely medical, but social. Thus insurance only shifts the liability, and does not change the human reality that is driving system costs. About half of the charity care recipients in these zip codes are in active (pro-active) relationship to one of our Supporters of Health. These individuals come back for hospital care at less than half the rate of insured patients, never for simple access to medications or medication management. The Supporters connect patients to the community systems—often neighborhood churches—for assistance with food, power and light, transportation to lower level medical care (instead of emergency transportation to the hospital). This can be understood as connection, practical coherence (“I am part of a community that cares”), agency (I can help myself; and I can pray for my Supporter of Health, balancing dependency with interdependency). Hope is not deferred to the next life; it becomes possible in this one. The most expensive charity care people fall roughly into three types: (a) on the trajectory toward the end of their life, (b) needing medications, and medication management for long-term conditions, including mental and (c) recurrent issues, like chronic pain and work injuries. All of these could be managed with greater convenience to the poor and less cost to health care organizations. Because most of the care of charity care is currently inappropriately experienced in the hospital emergency room, it appears to cost a great deal more than it actually needs to. Accepted, indeed required, accounting protocols demand accurate assignment of indirect cost (mostly sunk capital cost) and variable cost, which in a hospital includes a large portion of indirect cost. Usually, too, variable costs often account for about a quarter of the total that actually moves dollars out of the hospital’s bank into that of some supplier. The financial management opportunity in charity care is smaller, but more real than it appears. About three quarters of the accounted cost is bookkeeping. Once you have built an emergency room, you have to assign a bit of the capital depreciation to every single patient. But between a quarter and third of the imputed charges are direct variable cost incurred in real time. These are actual dollars spent in real time that could be available to do other things, including paying accountants or investing in proven community initiatives to avoid more direct costs. The 5 priority zip codes in downtown Winston-Salem have $17.3 million of charity care, of which $7.2 is a variable cost, an amount worth examining. This detour inside hospital finance is necessary to understand how different the accounting needs to be in order to clarify where the money should be going and could go, if charity care were correctly understood. Individuals needing charity care show up in the hospital ledger as an extremely expensive draw on hospital assets. But they are actually the symptom of an unhealthy population system forced to externalize onto the hospital a natural community adaptive process that, in a natural system, would never need a hospital at all. The issue has nothing to do with more efficient use of an emergency room. The issue is that a resilient population system would be vastly more efficient than any hospital could ever imagine. One could approach imagining a healthy population system two ways: by extrapolating from the edge of mobile technology, and by extrapolating from the actual generative nodes already working in the vulnerable census tracts. The first: we are all within 18–36 months at most from wearing watch-like devices that can tell anyone who cares our heart rate, blood sugar, and activity status in real time. The hospital could easily give such a watch to every one of the 1,500 people who will probably come for self-pay (paying out of pocket) again this year, which we do care about. We could afford to dispatch one of our Supporters of Health to check out what is happening and probably avert a direct variable cost event, or maybe make it into an outpatient experience or, at least, shorten the length of stay. On the other hand, we could tune the community systems that use sight, touch, and words for connectivity. This is especially useful for the cloud of people who we cannot see coming and probably do not need to come at all. Recently, Morning Star Baptist Church in Winston-Salem held a community outreach day in hopes of coming into the lives of its neighbors, most of whom live in distressed, poorly maintained apartments in a part of town most people do not even know exists. Morning Star is trying to find its way out of its own walls, not without a bit of fear among its members who have good reason to be nervous about the neighbors. And, in the process of finding its own life in the life of the neighbors, the church is opening the way for other partners, including the hospital, the neighboring university (which has a health screening van), public health and all sort of other helping entities that have difficulty finding the right people to help at the right time. The process is not laser focused and a lot of energy gets wasted on those who do not actually need it, but the enterprise is extremely effective. It builds connections that might be vital on some other day, it creates a new self-consciousness of being part of something that cares, it opens up many opportunities for many partners to express and thus develop their agency. This approach offers “hope with muscles” as Howard Clinebell (1996) once said. The community that expresses more qualities of life makes it far more efficient for providers to relate to (giving away blood pressure check-ups rather than heart attack care) and lets its members get on with … life. Normal life is rarely about health care and should not be. Normal life is about doing work, educating, learning and contributing to the thriving among the relationships that matter. The beginning of accounting is holding the funded agent accountable to a projected outcome, usually measurable by its observed impact on some intermediate process. Thus, a health care event is accountable for the satisfactory delivery of a standard unit of service defined by some authority’s interpretation of science. World One is marked by discrete units of service and World Two by larger bundles accountable over more time. Later phases of World Two imply a longer “warranty” for the bundles, thus pushing accounting to include the liability to encompass effectiveness and not just successful delivery. World Three focuses on the life of people who live in actual places. This is not already visible today, because hospitals already have population-scale liability for all the people in nearby places who cannot pay for their services, but are likely at some point to need something. We do not know of any hospital accountant who understands that they have a totally unmanaged population liability that could be managed. Most people on the finance side simply see cost that is consistent enough to project year by year so, that the budget can be constructed around the sizeable empty space the non-payment leaves in the revenue. They do not think of that empty revenue space correlating to knowable actual streets and places where people live, who are already in a trajectory that will create a need for services for which they cannot pay. These are known liabilities from known places with predictable costs that are totally unmanaged. One would expect better. But what would “better” look like? If the accountant wanted to, the accountant could create a dashboard with the local federally qualified health clinic and the local competing non-profit to get a more complete understanding of the cost and see his or her own institution’s cost in context. He or she could just as easily create a comprehensive dashboard of other clinical precursors such as low-level police calls for domestic violence and requests for food, power and crisis help from the most visible social service agencies. This would enable the accountant to more accurately understand the effectiveness of our clinical care in the context of closely linked services and begin to account for a more complete World Two bundle. The accountant might be so bold as to try to see evidence of the community’s life in play and wonder several things. Why are our Supporters and pastoral partners not doing a better job connecting the tangible and intangible assets? Why is our staff not doing a better job messaging and signaling to community members? Why is the health system not quietly coming under and strengthening the agency of the local community members through free education and training (including hiring a Supporter from the distressed apartment complex)? Why are community surveys not reflecting an ever-increasing level of confidence (hope)? All of that is knowable at granular scale. And all of it costs some money that should have a vital effect on that particular population. A healthy population—even the few thousand people in that one neighborhood—should cost less. The way to make it so is to invest in the causes of life of that population. If the investment is effective, we should see the cost of charity care decrease. That same process of granular logical accountability could be applied to every neighborhood where charity care is consistently evident at large enough scale to justify this type of intervention. Life-oriented management need not wait a generation. At least annually, systematic qualitative evaluations could be conducted, framed by a participatory, Leading Causes of Life model. On a quarterly basis, the population in each defined neighborhood or zip code (in conjunction with health system staff) could be viewed through the lens of four questions. Are we missing opportunities to intervene so patients receive quicker, more appropriate and less costly care? Are we actively managing their next charity care event to a timely and appropriate place? How many of these vulnerable people are also in the care of one of our community partners? Are we strengthening the link with that partner to assure timelier and less costly care for them, rather than waiting for a reoccurrence? The answers tune our management not only to the complexities, but practicalities of the relationship between the health institutions and the people who live in the places they care about. The analytics that spring from the questions evolve quickly into spreadsheets that would focus our budgeting processes to make sure we are planning to invest appropriately in training of neighbors, or in community-level Supporters. We would see in time to plan and budget so that our social service partners are engaged as partners to map the shared work and shared gains. Quite practically, this pushes the planning of one’s organizational activities into more complex dialogue or one risks promoting a passive rather than vital role among other kinds of organizations that must play active roles in the life of the community systems. The relationship shifts from outside groups asking for money or merely as subcontractors, to co-creators of a shared reality. For most hospitals, this would be a radical cultural change from philanthropist to partner. But perhaps partnership requires less of the traditional “sponsorship” and marketing, thus bringing other components of the hospital’s engagement with the population into view. An accountant who understands the life of populations could help the systems stay tuned to their appropriate influence on those systems. The community is no longer a place to invest some of one’s margin after the fact; it becomes the domain in which one manages the dynamics which produce the margin. The practical implications of that shift of management mind call for entirely new practices of forming, hiring, leading and measuring the performance of the managers of the systems of health care. At this point, nearly everything that is obviously new and challenging for the health care systems is almost as true for the public health systems, too. Although far smaller in terms of budget and staff and far more familiar with the toughest streets in their county, public health systems can have just as instrumental a view of the complex human systems in those places. A mind tuned to the complexity of those social systems would turn the attention—and the budget—away from single disease prevention strategies, toward dynamic webs of causation. And it would want to focus the budget and appropriately trained and led staff toward seeking vital, not just pathological causation. Good management would tune the apparatus toward life, forcing a more balanced budgeting process than is currently hard enough in the competition among diseases and causes of death. The practical reward of the use of vital logic would be found in community systems that themselves are more vital, dynamic, adaptive and resilient. Life would help find the way, if nurtured. What could be more efficient? Systems vitality is not an appropriate expectation of World One systems or its accounting. Systems robustness and resilience is a highly desirable framework in which to pursue World Two goals, but its accounting systems reflect a more constrained understanding of inputs, processes and outcomes. Thus, they send exactly the wrong signals among the networks, nodes, workers and partners of the population. Focusing on the life of the system, measured at appropriate scale and time intervals, accounting could accelerate a smart, vital cycle of improvement. This paper began with life and ends with accountability for what matters most. A longer treatment would include detailed notes on the competencies and character that this model of population health implies for those in positions of influence in the key institutions, especially those in health care and public health. Readers will notice that we have not even mentioned the many places where life-oriented research is needed in order to test the assumptions and even query some of what seems most obvious in the data. We have hardly mentioned the contributing streams that have shaped the major achievement of World One and made possible the momentum toward World Two—the thousands of diligent committees doing the laborious work of change making over these recent decades. If we have tried to look beyond, it is not for lack of respect for what makes the view possible. This sketch hardly taps the vein of hard-won wisdom that needs to flow into a serious consideration of how we might begin to put in place the learning and practice networks that some decades from now, could claim a similarly hard-won achievement in World Three – the highest level of health system maturation. It is work worth doing; it is what life asks and invites. Americans, Reducing Mortality, Utilization, and Costs. https://innovations.ahrq.gov/profiles/churchhealth-system-partnership-facilitates-transitions-hospital-home-urban-low-income (accessed October 9, 2015). Antonovsky, A. 1987. Unraveling the mystery of health: how people manage stress and stay well. San Francisco, CA: Jossey-Bass. Clinebell, H. 1996. Ecotherapy: A guide to ecologicaly grounded personality theory, spirituality, therapy and education. Minneapolis, MN: Fortress Press. Flexner, A. 1910. Medical Education in the United States and Canada: A Report to the Carnegie Foundation for the Advancement of Teaching. Bulletin No. 4.New York City: The Carnegie Foundation for the Advancement of Teaching. Gunderson, G. R. 1997. Deeply Woven Roots. Minneapolis, MN: Fortress Press. Gunderson, G. and L. Pray. 2009. Leading causes of life. Nashville, TN: Abingdon Press. IHI (Institute for Healthcare Imrovement). 2015. Improvement stories: What is a bundle? http://www.ihi.org/resources/Pages/ImprovementStories/WhatIsaBundle.aspx (accessed October 9, 2015). IOM (Institute of Medicine). 1988. The Future of Public Health. Washington, DC: The National Academies Press. IOM. 2003. The future of the public’s health in the 21st century. Washington, DC: The National Academies Press. IOM. 2001. Crossing the quality chasm: a new health system for the 21st century. Washington, DC: The National Academies Press. Ion, H. W. 2014. Internal Evaluation of Supporters of Health. Wake Forest Baptist Medical Center unpublished manuscript. Winston-Salem, NC. Kania, J. and M. Kramer. 2011. Collective impact. Stanford Social Innovation Review 9(1). Porter, M. E. and C. Guth. 2012. Redefining German health care: moving to a value-based system. New York and Heidelberg: Springer. Porter, M. E. and E. O. Teisberg. 2006. Redefining health care: creating value-based competition on results. Boston, MA: Harvard Business School Press. Salk, J. 1973. The survival of the wisest. New York: Harper & Row. Walker, B. H. and D. Salt. 2006. Resilience thinking: Sustaining ecosystems and people in a changing world. Washington, DC: Island Press. Weisman, J. 2015, June 18. Killings Add Painful Page to Storied History of Charleston Church. The New York Times. http://www.nytimes.com/2015/06/19/us/charleston-killings-evoke-history-of-violence-againstblack-churches.html?_r=0 (accessed October 9, 2015). Wright, K. R. L., A. Merkle, W. M. Reid, G. Robinson, B. Herzog, D. Weber, D. Carmichael, Donna, T. R. Balderson, and E. Baker. 2000. Competency Development in Public Health Leadership. American Journal of Public Health 90(8):1202 –1207. Gary Gunderson, DMin, MDiv is VP for FaithHealth at Wake Forest Baptist Medical Center and Professor of Public Health Science at Wake Forest University School of Medicine. Teresa Cutts, PhD is Associate Research Professor at Wake Forest University School of Medicine. They are Secretary and Research Director for Stakeholder Health and are participants in the activities of the Institute of Medicine Roundtable on Population Health Improvement. Dr. James Cochrane is Professor Emeritus at the University of Cape Town, Adjunct Professor at Wake Forest University School of Medicine, and Director of the Leading Causes of Life Initiative.